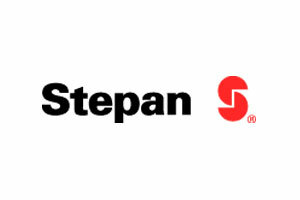 Stepan is a global manufacturer of specialty and intermediate chemicals used in consumer products and industrial application. Stepan is a leading merchant producer of surfactants, which are the key ingredients in consumer and industrial cleaning compounds. Manufacturers of ingredients for detergents, shampoos, lotions, toothpastes and cosmetics depend on surfactants to achieve the foaming and cleaning qualities of their products. Other applications include lubricating ingredients and emulsifiers for spreading of agricultural products. Stepan also produces germicidal quaternary compounds. Other specialty products are often custom-made to meet individual needs. These include flavours, emulsifiers and solubilizers used in the food and pharmaceutical industries. The company is also a principal supplier of phthalic anhydride, a commodity chemical intermediate which is used in polyester resins, alkyd resins and plasticizers. Polyurethane polyols and foam systems sold by the company are used in the expanding thermal insulation market primarily by the construction and refrigeration industries. Headquartered in Northfield, Illinois, Stepan utilizes a network of modern production facilities located in North and South America, Europe and the Philippines.